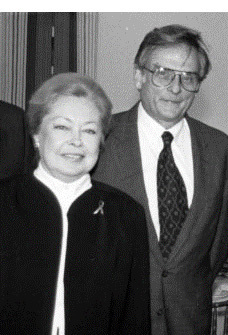 The journey through the universe of HIV was not an easy one for Mathilde Krim. When you are a pioneer and most of the world does not believe what you are saying you must maintain courage and vision. The Dr. Krim whom I have known is just such a person. HIV emerged as a new disease in 1981, precipitating major controversies and requiring major new scientific discoveries. The multitude of issues that hovered over the HIV epidemic would have discouraged any single person and frustrated any attempt to bring together di- verse groups of individuals for a single cause. But Dr. Krim was able to do this from the very beginning. Her legacy in the history of HIV is great. Her journey did not end with her recent retirement as Board Chair of amfAR, it continues. We pause but for a moment to acknowledge her legacy. We learn much from those who con- tribute to our understanding of the interaction of disease and the social and political fabric of a country. From the beginning, Dr. Krim was not only aware that HIV was a dangerous new infection but also that it would test our fundamental concepts of equality and justice. Dr. Krim is an example of an individual who was there at the beginning and remained steadfast throughout the vicissitudes of the epidemic. I first met Dr. Krim at an American Foundation for AIDS Research (amfAR) grant review meeting in 1985. I was invited to participate in the review of grants as a pediatric immunologist who was deeply engaged with the impact of HIV on children. What an incredible time. Although there were frustrations and disappointments, Dr. Krim’s leadership brought together dedicated scientists, individuals from diverse disciplines, and an approach to HIV that went beyond championing the normal re- search agenda to include targeted research, flexible approaches, integration of social and basic science, political advocacy, and a deep commitment to those who were affected and infected by HIV. Dr. Krim’s personal and political influence was not squandered on personal gain but was for the good of all those who suffered from the consequences of HIV. As important as the molecular structure of HIV was, she correctly perceived that HIV precipitated some of most critical issues of our time—stigmatization, discrimination, and violations of human rights. Under her leadership she promoted amfAR into an internationally prominent foundation that became known for its all-encompassing approach to the HIV epidemic. Her influence was used to foster change—change in individuals, organizations, and governments. There were times of frustration and discouragement. It was an epidemic that expanded rapidly and affected millions throughout the world. But she was steadfast and always considered what was best for those with HIV infection. amfAR was willing to fund research that had a high potential for impact on the epidemic but might be considered too “risky” for the slower and more cumbersome government funding agencies. One example was a basic research grant to Dr. Ruth Ruprecht of Harvard in 1987 to examine the impact of antiretroviral drugs on mother-to-fetus transmission of a retrovirus in a mouse model. Her work, using zidovudine (AZT) and alpha-interferon, provided the basis for a clinical trial of AZT in HIV-infected pregnant women and their infants to determine if such treatment could prevent vertical spread of HIV. As predicted by Dr. Ruprecht’s study, AZT led to a 60% decrease in the number of HIV-infected infants. These studies launched a world- wide program in prevention of mother to child HIV transmission. Thousands of infant lives have been saved as a result of amfAR’s initial support. Under the courageous leadership of Dr. Krim, similar grants to principal investigators and fellows in training have provided the initial and critical funding to permit them to realize their dreams of impacting the HIV epidemic. Dr. Krim maintained a vision of the potential for amfAR to impact on the global HIV epidemic. When I discussed with her the need for an international conference on prevention of mother to child HIV transmission to call world wide attention to the successes of research in the arena of prevention, amfAR made it hap- pen. In 1997 the first conference on “Global Strategies For the Prevention of HIV Trans- mission from Mothers to Infants” was held in Washington, D.C., a strategic location to gain political support for addressing the needs of re- source poor countries. Dr. Krim addressed the conference and offered her encouragement and support to those in resource-poor countries who had not yet experienced the benefits of scientific successes. The conference was repeated in 1999, where the first report of the successful use of single dose of nevirapine to prevent mother to trial HIV transmission was presented. A “call to action” generated at the conference resulted in the first $15 million of funding directed toward prevention of perinatal HIV transmission worldwide. I have not addressed Dr. Krim’s multiple awards or her international recognition; I leave that to others. For myself, I personally know her accomplishments, her compassion, and her dedication. I admire her tenacity and I know that the impact of her career in HIV has had a dramatic impact on the course of the epidemic and on individuals. I know that this impact will continue beyond our own lives.